Anna was extremely knowledgeable about Ravenna's claim to fame, mosaics. She was very accommodating to our desires and anxious to please. Would definitely recommend her for in-city touring. We did not go outside of the city so can't speak for that. TOUR GUIDE RESPONSE: Dear Karen, thank you for submitting your comments. I vividly remember the pleasant morning we spent together in Ravenna. You use positive words to describe my tour, but why do you say you "did not go outside of the city"? The tour you decided to book did not include any out-of-the-city. It was a 4-hours walking tour within the centre of Ravenna. Is that the reason why you rated it a mere 4 stars? Anna, was extremely personable and knowledgeable. I believe she went above and beyond, such as, letting us experience a baptism in a mosaic filled 1500 year old baptistery, priceless. A connection to an ancient time was firmly established. Would strongly recommend. Wayne from Phila. Anna was extremely knowledagble on Ravenna's history and mosaics in general. She was able to tailor the tour for my family's interests and was a fount off information at all the sites. It was invaluable to have her to explain both the mosaics meaning but also the history surrounding them. I could not recommend her highly enough! She brought to life the town and mosaics for all of us! Anna is an excellent guide. 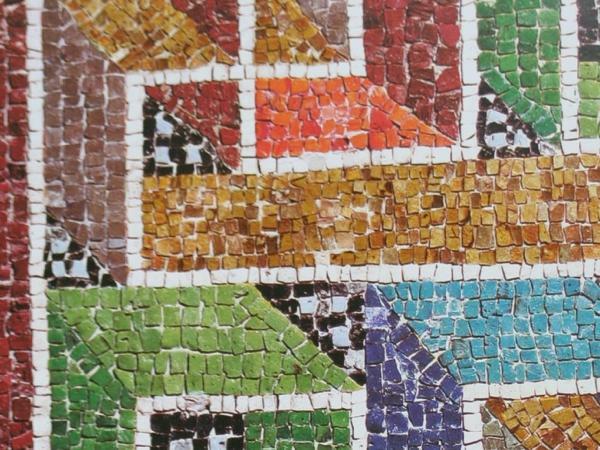 Her knowledge of and passion for Ravenna, its history and religious art gave context to the mosaics and really brought them and the city to life for us. Most important, Anna quickly grasped what interested us and was able to tailor our tour as we went, spending more time on the aspects that most fascinated us. Excellent English and a lovely person; highly recommended. Anna has an amazing knowledge of the history and significance of sites. Very pleasant and helpful in every way. We learned a great deal, discovering connections among historic events previously under appreciated. Anna is gracious in responding to questions and willing to pause allowing us to absorb the beauty and significance of each site. Our tour with Anna was a highlight of our visit to Italy. Anna is a very knowledgeable person and this makes the tour much more interesting. She provided information in many areas (economy, history, etc) and answered all of our questions. The places she took us are beautiful and doing the tour on bike gave us the real Italian experience. Anna was very knowledgeable of the area and was extremely helpful in guiding us through the town. I would highly recommend her to anyone interested in visiting the area! Anna was knowledgeable and delightful! I highly recommend visiting Ravenna with her! Anna was good, and brought Ravenna alive for our group. Quite simply, Anna is one of the very best guides we have ever had the pleasure to work with. She knows the art and history of Ravenna thoroughly, understanding the implications of every aspect of these fields. But she is also empathetic and responsive, tailoring the visits to the various sites just for us. There was never a question she couldn't answer! We also enjoyed just visiting with her while we had lunch (at a perfect place she chose for us). Anna is fantastic, and her English is perfect! Anna is extraordinarily knowledgeable about Ravenna's history and was extremely helpful in increasing our appreciation for the mosaics we were shown. Beyond the tour she took the time to ensure we found the post tour restaurant we had wanted to lunch at. Anna was terrific! We really enjoyed all the sites. Anna knowledge of history of the area was so complete. She also took us to a local lunch restaurant and made recommendations for local foods. Also made a recommendation and reservation for dinner which was excellent. If you want to see all the major sites of Ravenna we highly recommend Anna. It was a fantastic tour and Anna was an outstanding guide. Anna's knowledge of the history of Ravenna and the role its magnificent mosaics and the buildings in which they are housed played in that history is broad and deep. She brought to life for us how the ineffable beauty of those works of art carried historical, political and religious importance in equal parts. Anna is also extremely personable and wonderful to spend the day with. It was fun to learn about her and her husband's lives as farmers. Good tour by local by bike .We had a general overview of Ravenna,s old city,stopped for a coffe and a gelato.Also excellent tour of 3 of the significant Ancient mosaic sites and a visit to a current mosaic ist' studio.Anna is clearly a long term local as she was greeted warmly by other locals during our tour.Bikes were not new but perfectly adequate for the tour. Anna was very kind and oh so knowledgeable. We enjoyed her tour immensely. She certainly has the history of the city and surrounding area down the the finest details. We were looking for a tour with this much depth and we were not disappointed. Ravenna is a gem. Anna was even able to drive with us to the church on the outskirts of town just to make sure we found it! Anna you are highly recommended by us! Anna was great- very friendly, knowledgeable and thorough. She made the visit much more enjoyable than it otherwise would have been. Highly recommend her. You will not regret it. Our guide, Anna,was terrific. Her information was very detailed and interesting. We had a great experience with her. Anna was a wonderful guide. She was incredibly knowledgeable about everything that we visited. Whether a church, a public building, or something just scenic, her comments and explanations optimized our appreciation of Ravenna. I would recommend her to anyone looking for a guide. Our tour of Ravenna with Anna was really informative and a real pleasure. We hit all the highlights and were really educated as to the churches, mosaics, and history of the town. Anna is extraordinarily knowledgeable and very pleasant to tour with. The 7 of us had a great day! Our guide Anna was fabulous. She was able to convey her wealth of knowledge in an easy to understand way. Would definitely reccomend her to those travelling to Ravenna. Anna was terrific. She met us at the train station where we rented our bikes. This was an easy walk for us from where the cruise shuttle dropped us off. She asked us what we wanted to do or accomplish for the day and then gave us several options. We had a great experience riding bikes in Ravenna, but Anna is a first class tour guide as well and she did a great job taking us through the highlights of all of the things that you would want to see in Ravenna. it would be difficult to imagine a better guide than Anna. She is learned, articulate, never boring. Her English is EXCELLENT and every word was understood. The visits were extremely well organized; at the same time she was able to adapt to our particular needs..An outstanding Tour! Anna is one of the best guides we have used in Italy. She has an extensive knowledge of the many spectacular artistic sites in Rimini. I learned more from her than I have reading several books about the region. In addition she has a delightful, easy going personality. Wonderful tour of Ravenna with Anna. As a Ravenna native she was so knowledgable of the big picture as well as the hidden details, which made our trip so enjoyable. We can't imagine our trip to Ravenna without her professionalism and guidance. 5 of 5 for Anna! Personable, very knowledgeable, took me to places I would never have found on my own. A great way to start my trip in Italy. Got to talk with a mosaic artist, which was fantastic. Anna was the best part of our visit to Northern Italy, and I can't imagine visiting Ravenna without her expert input. She was very knowledgeable about the history of the city and churches and the symbolism of the mosaics. Her tour comes highly recommended - it's well worth the cost!! Punctual, knowledgeable, friendly, thorough -- excellent in every aspect, thanks again Anna! Anna's deep knowledge enriched my experience of the breathtaking treasures of Ravenna beyond all expectations. She allowed me to look and wonder, explained the religious, political, historical and artistic meanings of what we were seeing, and told me about how they were made and preserved, restored and conserved over the centuries. I had dreamed for almost 40 years of seeing these masterworks in person. I am very happy that I had Anna to guide me during my first hours in their presence. Anna did a great job of showing us the mosaics in Raveena and explaining the history of this intriguing city. We started out with a church S. Giovanni Evangelista where the mosaics were from the 13th century and much more simpler than several of the Basilicas that were in the 5th century. The beauty of the mosaics is fabulous and having Anna's great expertise on the history was a true bonus. She alos took us to a shop where modern day mosaics are made. Thanks for a great day in Raveena. Anna is a superb guide to Ravenna's treasures. She possesses a rich knowledge of the region's history and has a wonderful ability to describe the stories and individuals represented in the mosaics, as well as the artistic & architectural styles. We were enthralled for the entire 4-hour tour and finished with an appreciation of Ravenna's art that would have been impossible to acquire with any printed guidebook. Finally, Anna has a delightful and easy-going personality. TOUR GUIDE RESPONSE: Many thanks, dear Laurie. Please, let me know how can I send you some of our spelt. Anna is wonderful! Do not see Ravenna without some help from Anna. She knows her stuff and will make your visit so much more enjoyable. All of us were quite pleased with Anna and we'd do it again in a second! Anna was the most wonderful guide. She provided us with a carefully planned day which started at 10.00 and finished at 6.00 (our choice). She could not have been more generous with the information she imparted and brought the wonders of the mosaics at Ravenna alive. Her knowledge was second to none and without doubt made our experience of Ravenna a truly memorable one. Anna was a wonderful guide with a vast amount of knowledge about the mosaics in Ravenna. I would not hesitate to recommend her to other tourists. Anna gave us a great tour of Ravenna! She was very knowledgeable and adept at moving us away from crowds so we could enjoy her commentary. Her English is very good and she is very personable. Anna was fantastic. Really knowledgable about all things Ravenna, only too willing to help and a delightful person. We would highly recommend her as a tour guide. Definately five stars. Our group was not too excited about our upcoming tour of Ravenna due to lackluster comments about things to see. However, we totally changed our opinion about Ravenna after a wonderful tour with Anna. She was most knowledgeable and brought the sites we saw to "life". She speaks very good English, is very professional and pleasant to be with. Anna nicely accommodated our schedule and special interests. Her considerable knowledge of the history of Ravenna and the Byzantine treasured if the city made for a fascinating tour. We appreciated her patience and helpfulness with our many questions, as well as her clear and reverential manner of presentation. We could not have chosen better. Bravissima! Anna is delightful and we felt comfortable with her immediately. She is extremely knowledgable about Ravenna and showed us not only the obvious, but included hidden bits of information that you could only learn from an expert. You could do none better than hiring Anna - highly recommended. Anna was a fantastic guide to the beauty of Ravenna. She was knowledgeable and very pleasant. She gave us what I considered to be an "above and beyond" experience on our full day tour. Also, we made a mistake about the meeting place and she was very helpful and patient about it. (I emphasize, it was OUR mistake, not hers.) We had a lovely light lunch together and she also gave us a few extra highlights beyond the fabulous mosaics, such as a visit to Dante's tomb. I would HIGHLY recommend her services. Anna made our tour of Revenna both informative and enjoyable. Her knowledge of the city and it's sights made the tour a pleasure. "Tour by Locals" and Anna worked with us to correct problems with timing that significantly reduced the stress of travelling. We are grateful and cannot recommend more highly Anna as a guide when visiting Revenna. Annie was wonderful. We had originally booked to do the tour by bike, but with the heat (and an additional elderly person joining us for the tour) she quickly suggested changing it to a walking tour. Her flexibility was greatly appreciated. She is obviously knowledgeable on the History of the city and was very informative, pleasant and accommodating. We really enjoyed her tour. This was our first experience with "tours by locals" and we are amazingly impressed. Definitely the way to go. Anna was terrific and our experience in Ravenna was unbelievable. We had visited many years ago and like to so many thought we could do it on our own with a tour book. How silly we were. Anna's knowledge and ability to explain what we were seeing were just terrific and made what had been a unidimensional experience in the past a multifaceted learning experience. We highly recommend Anna! Excellent day in Ravenna. Anna was great and really showed us the perfect time in her town. It was one of the best decisions we made. We only had one day in Ravenna and she showed us (or told us where to go after her tour) everything that we wanted to see. Thanks Anna!! We loved Anna. We had a 4 hour tour in the heart of Ravenna and it was completely worth it. Anna has a great and deep knowledge of the Byzantine culture and shares it in a very pleasant way, sensitively making sure there is no overload of information. It opened up a beautiful and very interesting world. We highly recommend her! TOUR GUIDE RESPONSE: Thank you, dear Ingrid. I was so pleased to accompany you and Kuroda Roshi around Ravenna! May I publish a couple of the pictures you sent me to enrich the tour we did on the Tours by Locals website? My best wishes, Ingrid, hope to see you again. Anna was extremely well versed in the history and details of everything we saw. Would highly recommend touring Ravenna with her. We found Anna to be an excellent tour guide and very knowledgable on the subject of Ravenna and the wonderful examples of mosaics which she steered us around. There was quite a bit of ground to cover and she managed to get us there both on foot and by bus. We are happy to recommend Anna as guide to Ravenna for anyone who is interested in this area. We saw the exceptionally beautiful mosaics. Anna's commentary was so helpful - educated and informative. We could never have seen so much by ourselves.